This castle-like house marks the entry to the 5 star Atholl Palace Hotel. An hour long bus ride from Perth took us through scenic farmland, villages and towns on the road to Pitlochry at the foot of the Northern Highlands. We were seeking out Edradour, the smallest distillery in Scotland. 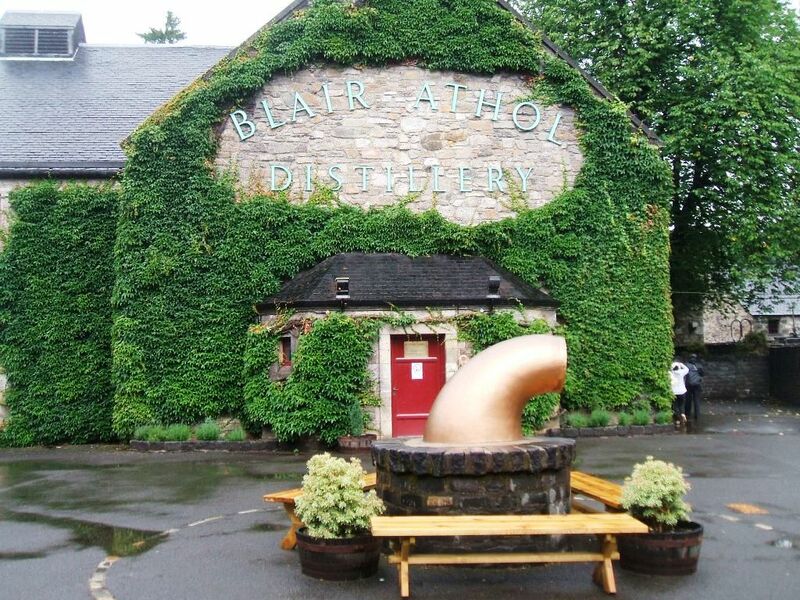 However, the two mile trek through fields and forests to get there convinced us to take the more accessible tour of Blair Atholl Distillery instead. Courtyard entrance to the distillery – no cameras allowed inside. 1. A 69,000 liter vat of mountain spring water is mixed with over eight tons of malted barley and fermented to make a ‘barley beer’ with 9% alcohol. After siphoning off the beer the remaining mash is sold as feed to dairy farmers. 2. The first distillation comes out of the condenser with a 25% alcohol level. The liquid is then diverted to a spirit still where it comes out as a clear liquid at or near 70% alcohol. 3. The amber color of Scotch comes from aging barrels of American Oak previously used to age bourbon whiskey. After four years aging Scotch takes on a pale yellow hue. After eight years it is a darker yellow, and twelve years later Scotch attains its classic amber color. 4. Scotch aged longer than twelve years is not necessarily a superior product. Evaporation takes place during aging which alters the composition and thus, the taste of the whisky. 5. Most Scotches are blends of up to 35 varieties to achieve a smoother taste. Blair Atholl, a relatively small distillery, produces 3 million liters/year of single malt Scotch, about 1% of the world market. 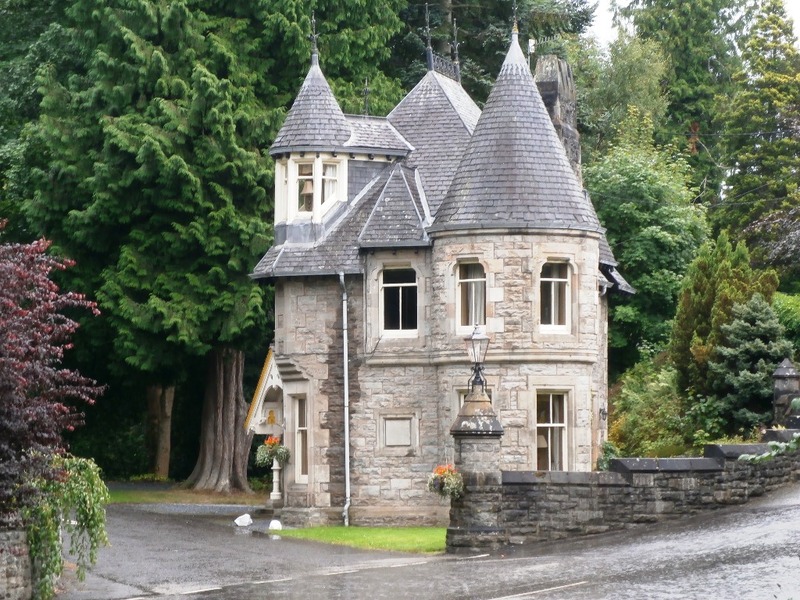 Pitlochry is a popular vacation destination and tour stop. We sampled a dram of twelve year old Scotch with instructions on how to maximize the experience. For example, a single malt Scotch should be stored at or below room temperature. Never chill good Scotch over ice, or you might as well get the cheap stuff and add soda pop. You can enjoy a milder taste by adding a little cold water of the purest quality available. Warm a small serving of whisky by cradling the glass in your hands. Breathe the vapors as you would a fine wine. Then sip and let the liquid move slowly over your palate before swallowing. We enjoyed the experience. However, the flavor of Scotch is still not one of my favorites, and I certainly would not pay over $50 for a bottle of single malt. 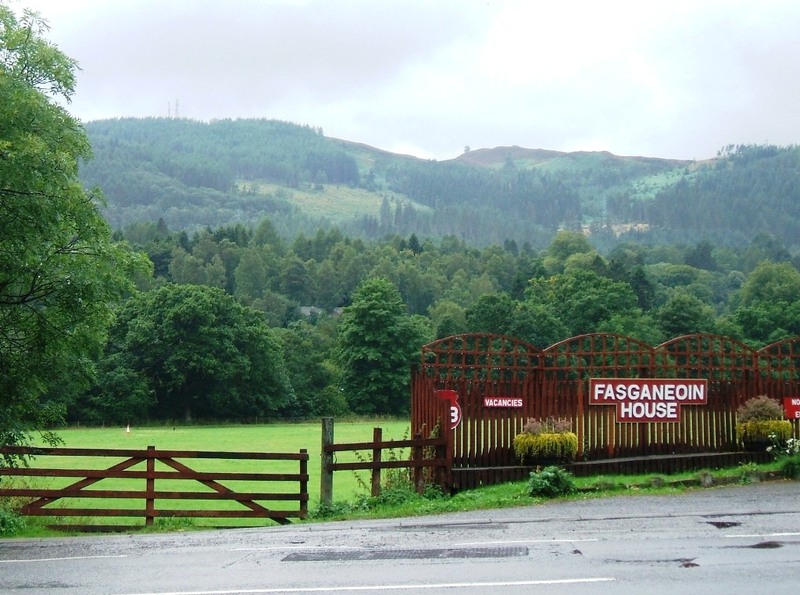 The countryside outside of Pitlochry is lush and scenic. 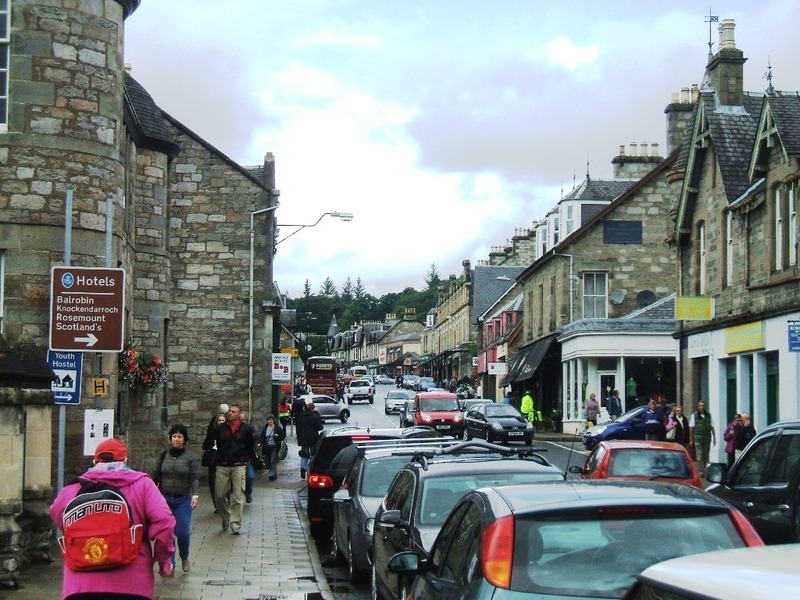 After the tour we walked up the road into the town of Pitlochry and found out it is a major stopping point for tours. We saw busloads of Russians, Germans and Swedes during our walk through town. A drive through the outskirts showed that B&B’s, hotels and guest houses were numerous. The town is bordered on the north by a huge national park, so the surrounding scenery is captivating. It is not difficult to see why it is so popular a destination. If we were to continue north from Pitlochry, the road would take us past Loch Ness to the northern city of Inverness, but that is a story for another day.